Our boutique hotel in Long Beach California offers the neighborhood locale you’re looking for with the quality service of an old friend. Our hotel was built in 1923 and we have maintained the Art Deco style in each of our Long Beach hotel rooms, while upgrading to modern amenities such as WiFi and air conditioning. Each of our 23 rooms have unique décor so that each of your stays for us is different. Choose from apartment style suites, kitchenettes, private and shared bath units for the hotel room that suits you. Each of our European accommodations have modern furnishings for a great night’s sleep. We offer free HBO and cable TV so you can still watch your favorite show on your Visio flat screen TV while you’re staying with us. Wake up to free Starbucks coffee in your coffee makers and stay connected with our complimentary WiFi. Our rooms with kitchens and kitchenettes have a microwave, refrigerator, and dishes for you to cook at your own leisure. 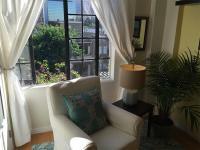 Find the room that’s right for you! Please note that we do not offer accessible rooms. Should you have any questions about the hotel room options to fit your needs, do not hesitate to contact us at 562-283-8755 or info@hotelroyal.com. This mid-century modern suite is perfect for guests who want more space and want their own full size kitchen. Take advantage of a fully stocked kitchen with pots and pans in addition to a microwave and fridge. Sleep in your spacious Queen bed and have more guests stay over on the Queen sized sofa bed. The Queen Bedroom Suite has a Private Bathroom for you to truly experience apartment style living. 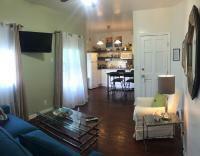 Apartment style living at an affordable price. Cook in your fully stocked kitchenette and sleep in your orthopedic mattress with luxurious linens. The Kitchenette Studio gives you the freedom to enjoy Starbucks coffee in your room every morning. 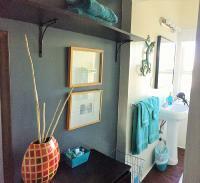 This room comes with a private bathroom for apartment style living. The freedom to cook when you want. Take advantage of every bit of space in your studio with a fully stocked kitchenette, complete with a rangetop, pots and pans for you to cook with. Have a great night’s sleep in your Queen Murphy Bed and enjoy the space in the morning when it’s tucked away. 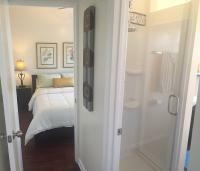 The kitchenette studios come with private bathrooms for apartment style living. Enjoy all of the amenities of home. Enjoy beautifully furnished units featuring unique décor and great amenities that create a home away from home. Sleep comfortably on your orthopedic mattress and wake up to Starbucks coffee in your coffee maker. The Visio flat screen TV has HBO available and you can stay connected with our high speed WiFi. Your private bathroom comes with complimentary toiletries and a hairdryer. Enjoy the amenities of home. Stylish decor across our unique suites. Each of our studios are decorated differently so your stay is unique each time. 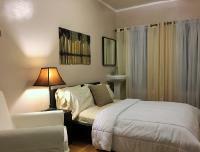 Stretch out on your Queen bed and enjoy free HBO and WiFi on the Visio flat screen television. Wake up to Starbucks coffee in your coffee maker and keep snacks in your mini-fridge to heat up in your microwave. 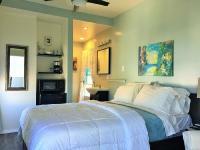 The shared bathrooms are cleaned twice daily and shared between three guests. Locked for privacy and cleaned twice daily. 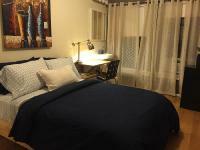 Enjoy your uniquely decorated studio that has everything you need for a great stay. Watch free HBO on your flat screen TV and stay connected with complimentary WiFi. Sleep on an orthopedic mattress with 300 thread count linens and wake up to Starbucks coffee in the coffee maker in your room. 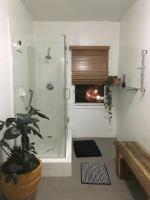 The shared bathrooms are cleaned twice daily and shared between three guests.